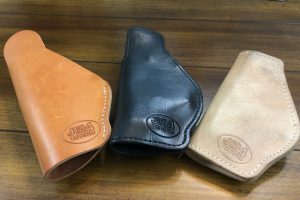 (From left to right) The Roughneck, High-Ride and Original Quick Click and Carry holsters from JM4 Tactical use rare Earth magnets in their design. A few years ago, JM4 Tactical took the concept of concealed carry holsters in a new direction when they released the original Quick Click and Carry holster. The holsters use extremely powerful rare Earth magnets in fastening it to the wearers clothing. This allows the holster to be worn even without a belt, and the powerful magnets provided some retention of the gun inside the holster itself. The ancillary benefits of the magnetic holster allowed it to be stuck inside safes, attached inside of vehicles or concealed carry bags and the like. I really liked the original design when I did a review on it over a year ago. Since then, JM4 Tactical has released some variants of their proven design, and they are worth telling you about. As you see in the photo, the basic look of the holsters is the same. There are a couple different sizes of the holster, made to fit a line of guns in that size range. A pair of rare Earth magnets, one in the holster and one in a leather flap, are clipped on either side of the garment, and securely hold the gun. All of the designs use only leather in their construction and are stamped prominently with the company logo. How high your gun sits above your waistband has implications on concealability, retention, and draw. A gun that sits low is easier to conceal, and because it is further down inside the pants, makes it slightly easier to defend against someone trying to disarm you. But this position makes it difficult to get a good ‘shooters grip' on the gun prior to it coming out of the holster. By shooters grip, I am referring to the ability to achieve your natural grip which should be high on the backstrap. As a result, the presentation of the gun can be slower than one that allows this grip right from the start. 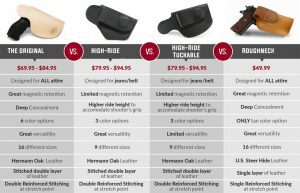 Depending on the ride-height you like will determine which holster works best for you. The original design produced a low ride height, and there was no way to adjust it. Many people liked this position, especially in workout clothing, where they typically did not have the additional structure of a solid gun belt. But if everyone loved the low-ride height, I wouldn't have to tell you about the Quick Click and Carry High Ride version. 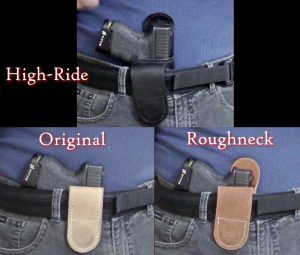 The High-Ride uses the same exact design as the original but moves the clip down on the holster. This positions the gun higher above the waistband and gives access to a natural grip right off the bat. A result of doing this caused the magnetic retention on the gun to move further toward the muzzle end. This dramatically reduced the pull on the gun and its retention. It still provides some, but not nearly as much as the original design. You can order the High-Ride in a tuckable or non-tuckable version. The tuckable version is for those who like to tuck their shirt in. In the video, I am using the non-tuckable model. The company uses thick, double-sided, high-quality Hermann Oak leather. The stitching is nice and the craftsmanship is great. They offer a few color variants from a natural light color to dark black. Because of the leather used, original and High-Ride aren't cheap. The MSRP comes in at $70-85 and $80-95 respectively. The price tag on the Original and High-Ride was a little high for some shoppers who wanted the benefits of the magnetic design, so the company produced the Roughneck. A holster coming in at about $50 dollars. It uses the same high-quality magnets but foregoes the expensive double-sided, Hermann Oak leather for a single piece of steer hide. This doesn't change the effectiveness of the holster. The single piece of leather leaves the backside exposed, which only creates an aesthetic difference. Before shelling out even $50 dollars most people want to know if their purchase is going to be worth it. I find the magnetic concept of the holsters to be a great alternative when you can't wear a belt. The original design lends itself, especially to these times. But even if you are using a belt, both designs work great. The magnetic clip allows the holster to be removed very easily, and as anyone who has a leather holster knows, leather feels good against the skin. I personally know many women who especially love the magnetic holster's design, one of them being my wife. Is it going to be the best holster you have ever worn? I always say holster selection is extremely personal. But the company offers a 10-day money back guarantee, so if it appeals to you, and in your price range, you may want to give it a shot. Stay alert and God bless.